Apparently, rummaging through people's picnics or raiding their kitchens for crumbs just wasn't enough for one opportunistic ant. This little thief had his eyes set on a much more valuable prize. A fascinating video has been making the rounds on the internet in recent days, and it's easy to see why. 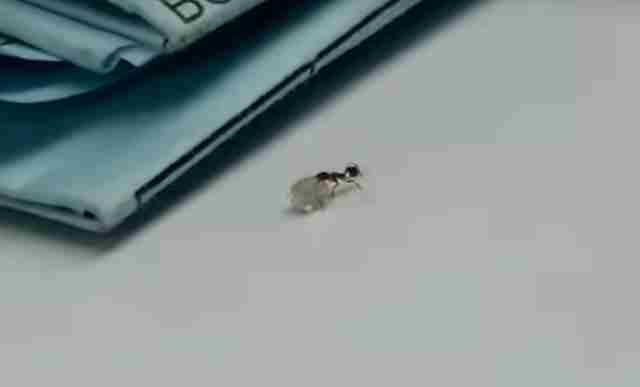 The clip, purportedly taken by a diamond wholesaler in India, shows a lone ant making off with one of those precious stones that had been left on the table. What interest an ant would have in a diamond is unclear — perhaps he mistook it for a sugar crystal? In any case, the ant seems determined to carry the loot back to his queen. Given the exorbitant price of diamonds, and the fact that he was caught in the act, chances are better than not that the person filming recovered the nearly-stolen jewel (humanely, we hope). But it just goes to show that, although tiny, ants are pretty darn tenacious.